These 36 women—all studio owners—aren’t just inspiring today, but every day. From surviving horrific accidents and having to learn to walk again to giving up careers and following their hearts to the yoga mat (or Pilates reformer or indoor cycling bike), these incredible females made some of your favorite classes possible. They have not only fostered healthy, happy communities but they’ve used their courage to encourage others to make big changes in their lives, simply because they can. Kylie grew up dancing, while Claire was a certified Pilates instructor. So when the idea came for these two friends and workout buddies to open their own studio, they jumped on the business venture. Since dance and Pilates often use a barre-like workout routine, they decided to open a studio that would help others meet their goals and see results. They were driven by their passion for barre to create a space that was bright, fun, friendly and an escape from the stress of everyday life. Up next? Opening more locations! Donna lovingly refers to herself as a “studio junkie,” having dabbled in every type of workout from CrossFit to dance. But then she suffered an injury that causes her to gain 40 pounds and needed a low-impact exercise that would help her get back in shape (but also not be terribly boring!). She discovered barre and soon started teaching it, even developing a special hybrid class called BarreFusion. Though she never planned to open a studio, after others started falling in love with her method, she opened a space where anyone could walk in feeling comfortable and walk out feeling confident. Up next? Her team is working on virtual memberships, expansion, teacher trainings and unique workout formats. From her days on the soccer field to running half marathons, this West Coast native has always had a passion for fitness. She didn’t understand the amazing results that group fitness could have until she discovered the Lagree Method on a trip to Southern California, and she has been hooked ever since. Ally also fell in love with indoor cycling and taught classes in San Francisco. But as a strategy consultant, she spent four days a week on the road and felt pinched for time for fitness, health and friendships. After years of this lifestyle, she decided to make a change to by leaving Corporate America, moving to Austin, Texas, and opening Pure Pilates Austin, which teaches the Lagree Method on the Megaformer machines. Up next? While working hard at growing her two Austin studios, she’s also keeping an eye out for more locations. For the past 15 years, Esther has been thoroughly involved in the fitness industry: teaching group classes, serving as a brand ambassador for Lululemon, and learning all she can about leading and encouraging a healthy lifestyle. Through goal coaching with Luluemon, Esther finally came up with a clear vision and quit her job in 2013 to take a part-time job as research project manager at the University of Maryland. It was there that she came up with the plan to open Baltimore’s first dedicated cycle studio. Up next? Her team is working towards opening a second studio in Canton this year. They have plans to open a third and fourth in the county in 2017. After the loss of her mother, Jody started training for endurance events as a way to cope and turn her attention toward something positive. Throughout training, she realized just how powerful and amazing our bodies are and what they’re capable of. The experience made her want to pay it forward to other people and help them find their inner strength, too. While training for her longest triathlon in San Diego, she discovered the Megaformer workout and loved it. Since she and her husband had been thinking about returning to Boston to be closer to their family, and Jody knew there were no Megaformer studios there, she decided to open a studio. Meg trained in ballet and jazz since she was 6 years old. She loved the art form and the discipline it took to maintain her routines and postures, and she dreamed of having her own studio one day. For her, Mad Dance House is a real dream come true and something she’s been planning since, well, childhood—even teaching her brothers and sisters dance in a wool shed on their farm. Today, she’s thankful to have her studio in Brisbane, a place that feels like home to her and the best place to grow her passion and drive for dancing. Up next? Opening a cafe in the studio. In her mid 20’s, Shawna was hungry for a workout routine and a way to integrate fitness into her everyday life. She tried everything: personal trainers, lifting, running, boxing, Zumba, yoga and barre. After four years of nothing really capturing her attention or motivating her, she took her first Xtend Barre class and was immediately hooked. 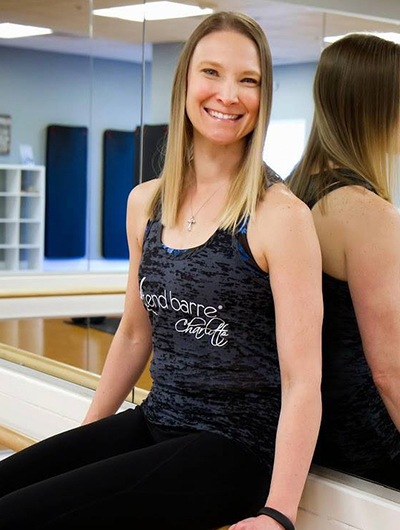 She knew she had found ‘the one.’ While it took a while for her to open up her own studio—she worked in the federal government for 16 years and moved cross-country not once, but twice—she finally opened her own Xtend Barre location in Charlotte. Shama left her job as a corporate attorney in Chicago with one mission and one very big dream: to start a company that would revolutionize fitness. With a small business loan and a lot of courage and strength, she opened AIR Aerial Fitness and built her company on the challenge to always think outside of the box. In the past six years, AIR has locations all over the country, from Chicago to Los Angeles to Charlotte. In the next 18 months, they’ll continue to expand with new locations. Up next? Expect to see many more AIR locations opening in the next 18 months. Keri and Gretchen met while they were working out together: Gretchen was a personal trainer, and Keri was a group fitness instructor. As they took new classes and challenged their bodies, they would often talk about how they would love to open a studio that offered a big mix of classes instead of just one particular workout. Three months after they met, they stopped dreaming of a studio and started creating one. Gretchen quit her job in marketing, and today, they have a system of six classes that mix different exercises at their studio, appropriately named System of Strength. Their promise? That the 60 minutes in class will never waste your time. Up next? They’re talking about opening a third studio in Columbus and possibly a fourth studio in Ohio. In the past 20 years, Molly has discovered how to truly love her body. When she first started working out, it was because she hated her body and wanted to change it. But now, she works out because she loves it. Especially since it’s endured and conquered having babies, eating pizza with children, training for races and, of course, opening her studio. She wanted to create a welcoming place where people could get an awesome experience and leave feeling more confident and happy. Enter: Crowbar Cardio, a hybrid workout that uses body weight exercises and IndoRow machines for a full-body exercise. Carrie grew up playing tennis and running yet always felt like she was inflexible. But then she discovered The Dailey Method, and her life completely changed. Even though she says that she’s had some pretty cool jobs—including working five Olympic games with NBC—her all-time favorite is teaching. Once she became a Dailey Method instructor in the Bay Area, all she could think of was opening her own branch and running her own business. Today, she’s the owner of The Dailey Method in Denver and co-owner of The Dailey Method in Boulder. Up next? Adding cycling classes at her Denver location. After being a lifelong athlete and playing tennis in college, Laura left school with a shoulder injury. She looked for an exercise to replace sports that would be safe, effective and fun. She took her first yoga class—Bikram—right after graduation and fell in love. She found yoga to be similar to tennis because both workouts were physically challenging and allowed her to sweat each day. After a year of focusing on Bikram, she moved to Houston and discovered Baptiste Yoga, and has been practicing it almost daily since 2009. In an effort to inspire others and redefine what a yoga studio should look like, she opened BIG Power Yoga, now with two locations in Houston. Up next? Supporting an aspiring entrepreneur—her husband—in his woodworking business. From a very young age, Amanda enjoyed group fitness and dance, and even set her sights on becoming a runner by completing several half and full marathons. However, her body didn’t like running quite as much, and she found true happiness (and a great workout!) in indoor cycling classes taken during business trips. Going to those classes gave her a chance to meet people, and it inspired her to bring that same cycling community to Kansas City. Up next? Continuing to expand their offerings. Esther went to law school in the United States and Germany, so she wasn’t able to fulfill her dreams in other countries she lived, where her degree didn’t hold the same weight. She made the best of her day job as a contract attorney, but discovered barre after going to various studios. She loved it so much that she became certified. In 2011, she and her husband moved to London, where not only was she still stuck being a contract attorney, but she also couldn’t find a barre studio she loved. She finally took the leap of faith and opened her own studio a mere few months later. Up next? Opening a new studio and having another baby (a boy! )—both due in the spring. When Kimberly looks back on her life, there’s never been a time when she wasn’t active. She took her first yoga teacher training while in law school in the late ’80s. She also became a professional triathlete and started spinning when it was created by Jonny G in the ’90s. She also thought it made sense to combine yoga with cardio, so after 18 years of working as a lawyer, she decided to make a studio dedicated to her preferred workout. Enter: YAS – Yoga and Spinning. Up next? She’s expanding her YAS Teachers Training to include a 200-hour Yoga Alliance certification, which includes both yoga and spin. Following the 2010 Winter Olympics, professional snowboarder Stephanie suffered a horrific accident that broke her back and effectively took her out of the game. Her rehabilitation programs consisted of Pilates, which literally helped her get back on her feet—and her board. The experience, though difficult, ignited her passion for women’s health. She wanted to create a space that felt luxe but wasn’t intimidating, so everyone felt like they had a safe, comfortable place to work out. Today, Studio PP offers 52 classes, ranging from Pilates and HIIT to yoga, barre and boxing. Up next? Expanding their online training guides, eBooks and merchandise. Summer grew up dancing; started taking yoga in college; tried Pilates, hiking and snowboarding in her mid-20s; and then trail running in her early 30s. But she always had a soft spot for Pilates and yoga, and she knew one day, she’d make it her career. Her journey to teaching Pilates and yoga started in San Francisco and took her to Denver and Miami. After teaching at the flagship Pilates ProWorks in San Francisco, she knew she had found the company she wanted to grow with. Up next? Opening a second location. Jenny’s fitness journey began when she decided to quit smoking and start running triathlons. She wanted to take control of her health, and exercise was her first big goal to accomplish. But when it came time to open her own studio, she didn’t want to stick to the basic offerings that everyone else provided. Instead, she wanted to bring together multiple practices, all focused on improving the overall health and lifestyle of her clients. Her studio, Magna, offers not only fitness classes, but also chiropractics, acupuncture, sports massage and nutrition guides. Up next? Continue to hire, smart, talented people. Susannah started running in the fifth grade and has never stopped. It wasn’t until college that she discovered yoga as a way to cross-train and counterbalance running and other activities she loved: hiking, spinning and lifting. She also found mental clarity from yoga, something that didn’t always come with her other forms of exercise. She opened up her own studio to help others find—and indulge in—the same experience. Up next? Grow Hot Pilates Plus across the Southeast. Lauren used to hate yoga. As a captain of state championship teams in basketball, tennis, track and lacrosse, she didn’t get the appeal of flows, poses and om’s. She only gave yoga a chance because her now- husband suggested she try it, and she wanted to prove him wrong. Instead, she was proven wrong: She’s swapped running 60 miles a week for yoga classes and eventually quit her job as a vice president on Wall Street to open her studio. She also just published her first book, Retox, this year. Up next? She’s working on the process of doubling her studio schedule—and coming up with new book ideas. After competing as an Olympic runner, Sarah started coaching recreationally. She loved being able to pass along her methods and expertise to aspiring runners. Since running had always been a passion, she wanted to give others an opportunity to run and reap the benefits of what she calls “the best way to stay in shape.” Whether her clients can run the length of their driveway or not, she hopes to help them love running just as much as she does. Fitness has always been a way for Stephanie to release stress, but in college she took it to the next level as a Philadelphia Soul Dancer and an on-campus fitness instructor. Cardio was always her go-to, but a few years ago, she started incorporating strength training into her routine and saw major changes. When her friend introduced her to the Megaformer in 2013, her mind was blown—and she was sore for four days after the class. She quickly made up her mind that she’d take the Megaformer workout to Philadelphia by opening her own studio. Before opening her studio, Jennifer worked for 17 years in the real estate and mortgage industry. She started taking Pilates after suffering from back pain for spending too much time in her car. After her very first class, she felt an immediate difference in her posture, and only a few weeks later, her back pain disappeared. It also left her feeling less stressed, even when sitting in her car in traffic in Souther California. There was no question: she was hooked! When the opportunity came for her to complete teacher training and open a franchise, she knew the moment had arrived for her to leave a job she didn’t love to create one that she absolutely did. Up next? Opening a second location downtown in April! Even though she’s always had an abundance of energy and a great appreciation for the outdoors and movement, nine years ago, Karen found herself drawn to yoga. She started working in a restaurant that was in the yoga studio that she now owns, and as her yoga practice grew, so did her desire to branch out on her own. When the opportunity came to take over Yoga Pearl, Karen knew the timing was right. And it simply felt like the right thing to do: she believed in the space, the practice and the teachers, and felt like something bigger was pulling her into the leadership role. Today, she’s opened a new restaurant in the space and rebranded to really give her clients a deep connection to their lives and practice. Up next? Starting a non-profit to benefit those who have been victims of trauma. Chelsea grew up as a dancer and was quickly drawn to Pilates as a way to enhance her routine. She loved the way it provided a mind-body connection and started teaching it in 2000. From there, she began studying and teaching Shiva Rea’s Prana Vinyasa yoga as well. Since there were no Pilates studios when she moved to Raleigh, she decided to make her dream a reality and open a studio that would show the community the wonderful techniques of Pilates and yoga. Growing up, Stephanie was a horse jumping competitor and found the adrenaline high from show jumping unlike anything else. She played three sports in high school, but after graduating from college, she felt like “working out” became a necessary evil that she did but didn’t enjoy. Her view changed after she stumbled across an indoor cycling studio. Working out became something she looked forward to again, just like horse jumping. She decided to open her own studio to give people that same energy and renewed connection that she found on her bike. At the age of 19, Jennifer was a passenger in a head-on collision. Though she survived, she was told she’d never walk again, or if she did, she would have a pronounced limp. She made it her mission to prove them wrong. She started with swimming, then cycling and then running—even completing a marathon. But after a decade of being a triathlete, she needed more balance and discovered yoga. She realized that it wasn’t just one workout that made her body and mind connection strong, but the combination. She used what she’s learned as an integrative rehabilitation therapist to create what she calls a playground: her studio, OMpower. They offer indoor cycling, yoga, rowing, TRX and dance classes. Up next? She wants to get back to teaching and writing. But most importantly, she wants to create opportunities for women in leadership and entrepreneurs to gather support and tools needed to progress and grow. Molly’s career in fitness began in 2000 at a local gym, where she folding towels and greeting members. She knew from the start she wanted to move up the ranks, so she became a personal trainer and, eventually, the director of membership. But as she started to become more involved at the corporate level, she missed working the personal connection that comes with working with members. So in 2010, she started hosting indoor and outdoor bootcamps, until she grew tired of carrying kettlebells around the city and decided to open a studio of her own. She had the dream of making it feel like a giant house where everyone would feel comfortable working out and hanging out. Her home, FUELhouse, has been open a year, and she says she’s still pinching herself. Cari always loved teaching fitness classes in high school and college, even post-graduation. She found it was something that helped connect to her body and stay injury-free, especially while she was training for marathons and triathlons. In the back of her mind, she knew she eventually wanted to open her own studio, but the magic happened when she took a trip to Costa Rica. She took classes on a Surfset board and realized what St. Louis needed was a surfing studio! Now, Core 3 offers Surfset, RealRyder cycling and TRX—all exercises that strengthen your core. Deanne and Michelle are really a power team. With Deanne’s background in professional dance and Michelle’s 17 years of teaching Pilates, they’ve both devoted their lives to movement, health and fitness. After many years of exercising independently, they decided to create a space where everyone would feel inspired to be their best self, regardless of their age, gender, or physical conditions or limitations. Up next? They will be launching a comprehensive teacher training certification program. Up next? They’re looking into opening a second location and starting a Pilates instructor training program. For Michelle, fitness was the ultimate escape, the one time during her busy day that she could lose herself in the movement and leave everything behind. While she was fine motivating herself at the gym, she preferred the energy and magic of group fitness classes. But they had to be the right ones: challenging, innovative and exciting with inspiring instructors and workouts. After teaching classes herself, she decided to open her own studio that would give other people the same sense of fulfillment and escape. At the age of 16, Lacey was already making health and fitness her life, starting with teaching classes at the YMCA. For years, she tried every type of exercise and wanted to create a method that would combine everything she learned into one workout. She began by studying Callanetics, and in 2008, perfected her own method, branding it Kondi Fitness. Today, her classes offer a mix of strength and resistance training combined with cardio. Up next? Taking her workouts online. They started as workout buddies, then barre instructors who taught at various studios. After searching for the most challenging and effective barre technique without much luck, they decided to create one of their own. What started as a barre studio now offers TRX, indoor cycling and yoga classes, giving an option for every fitness enthusiast. Lindsay Tigar is the editorial director for ClassPass in New York. She’s an aspiring boxer, wannabe yogi and lover of cardio dance (though she has no rhythm). She loves traveling, handwritten cards, live music and good vibes. She believes in a healthy balance of veggies and champagne, and can usually be found exploring the city with her cute pup, Lucy.